Although flashguns are eminently useful for all kinds of photography, their light can often be too harsh when they're pointed directly at your subject. 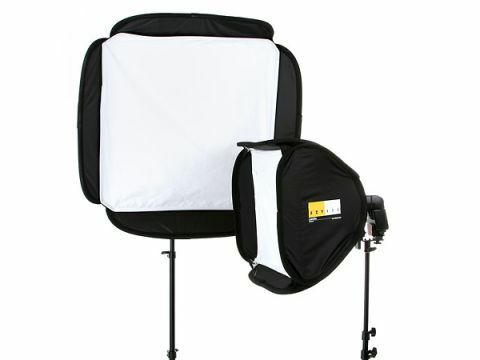 Built-in reflector cards and diffuser panels enable light to be bounced and softened respectively, and adjusting the position of the head can be used to further extend possibilities. Lastolite Ezybox Hotshoe, however, takes things even further, turning an ordinary flashgun into a portable softbox. Available in three separate sizes - 38cm x 38cm, 54cm x 54cm and 76cm x 76cm - it comes with an adaptor ring, flash bracket and a white fabric, which serves as the diffusing panel. Assembly only takes a couple of minutes, with the help of the provided instructions. The Lastolite Ezybox Hotshoe can be mounted on a stand for studio or location work, although for handheld use you need an additional bracket to provide enough distance from the camera. Thanks to the lightweight materials used, the Ezybox doesn't add much weight to a DSLR mounted on a bracket, although it can be a little awkward when handling for extended periods of time (less of an issue with the smallest model of the three). The ring can be quickly slipped out from the back of the Ezybox, and once the diffusing fabric is pulled away from the Velcro edges it's simply a case of folding the head and unscrewing the bracket. It's perhaps a little pricey for what it is, and for more mobile photography you'll have to factor in the price of a bracket too, but it's ideal for photographers who divide their time between studio and location work.